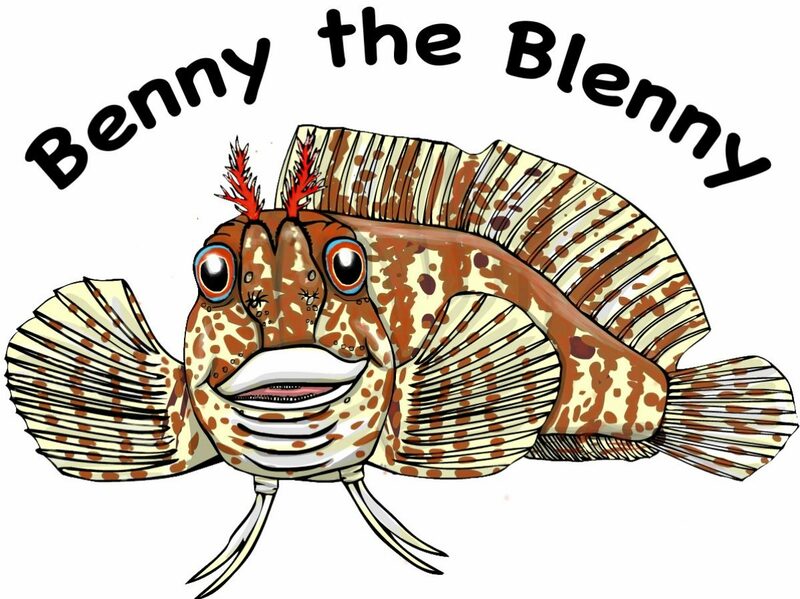 Benny the Blenny aka the 'fish with antlers'/The Christmas Tree Fish – Page 6 – The fish that blogs from under the sea! The reason I fought to keep my territory in March was so that I have a safe place to raise my family. In April, I got my crevice ready to become a nursery by cleaning the floor and ceiling. I then released some special chemicals (called pheromones) from glands near my tail and wafted them into the surrounding seawater. This was to tell the local female tompot blennies that my home was ready for them to lay their eggs. The first female to visit, let’s call her ‘Belinda’, came bustling up and posed at the front of my crevice. I checked her out, liked what I saw and then invited her in. We got to know each other as I gave her a few pecks on the cheek and a gentle nudge. She had a good look round my home and it must have pleased her because she laid a batch of beautiful purple eggs on the floor of my crevice. I fertilised her eggs quickly. I’m going to be a Dad!! Now the introductions are over, I will bring you up to date with what I’m up to. I spent most of the winter tucked up deep inside my crevice home. At the end of March, with the sea getting a little warmer, I got more active. 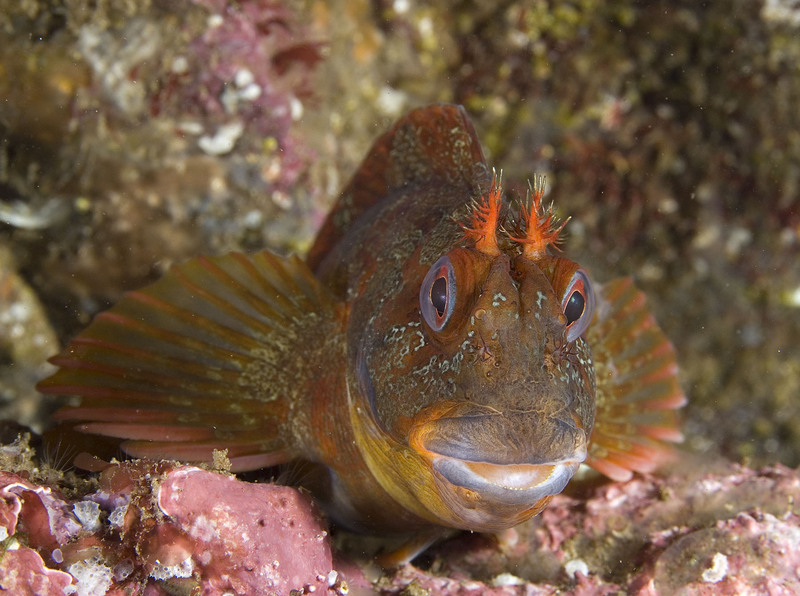 I’m not the only tompot blenny on my reef and my male rivals started challenging me to take over my home and make it their territory. A younger male came and tried to chase me out of my home. As you can see from the photograph above, we both stood our ground for a while and sized each other up. I opened my mouth in a threatening way and showed him my teeth and, when he didn’t back off, I darted at him and gave him a bite on his lip. He tried the same back and this is called ‘mouth fighting’. I was better at dodging his bites and managed to land a few nasty nips with my sharp comb-like teeth. He backed off and I showed that I’m the boss of my territory! 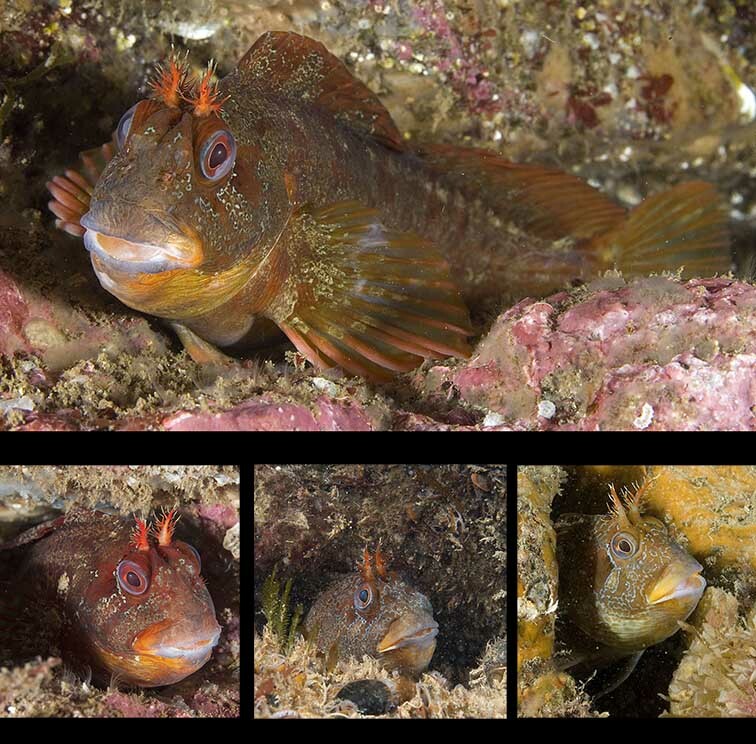 I’m a pretty successful coastal fish and can generally be found anywhere from just below the low tide mark down to 30 metres deep where there is suitable habitat. I need a cosy hole or crevice to live in and this can be in a rocky reef, under a boulder or in something man-made like a pier or ship-wreck; I’m easily pleased! Did you know that if you want to know where you can find a strawberry anemone, a spiny starfish (or even the strange animals and plants that live on land) you can use the NBN Gateway website to find out? I can see what’s going on – I’m looking for my next meal or keeping an eye out for a predator that wants to eat me! I can sniff the water for interesting smells with my superb head tentacles and smaller nose tentacles. Is there food nearby or maybe a partner? I can dart out and bite anything that comes too close with my strong comb-like teeth. 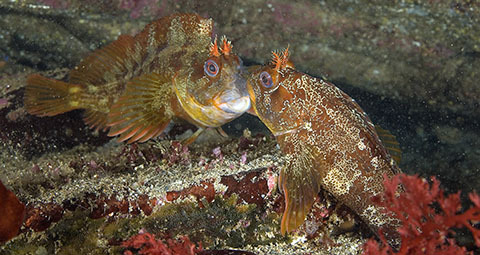 (I belong to a group of fish called the combtooth blennies). I keep the rest of my body tucked safely away. 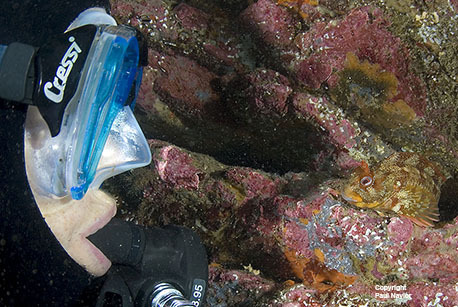 The other pictures show some other tompot blennies looking out from their homes too! ‘Fins alive!’ Who is this looking into my crevice? I’ve been watching their bubbles and I’m so nosy I’m going out to take a look. It’s the diver that keeps popping by, when its calm, to see what I’m up to. She makes strange squeaky noises as though she’s trying to talk to me. I think she’s saying that she’s written a book to tell everyone about my life. 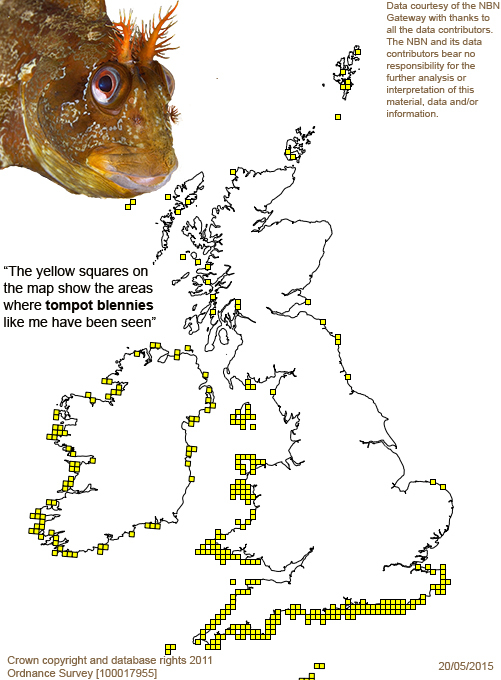 I’m such an amazing fish that now I’ve got my own blog – that’s technology for you! Talking of technology, have you noticed I don’t need a large air tank on my back like the one she has? I’ve got gills that take the oxygen I need straight out of the seawater. The diver is much bigger than me but I’m not afraid because, if she gets any closer, I know I can wriggle safely back into my home. My body is wedge-shaped and ideal for slithering into narrow cracks in the rock. You can see that I’m a small fish around 15 centimetres long, but you will soon find out that I am the boss of my rock!